Agmatine is a naturally produced byproduct of Arginine. As a recent development still being studied Agmatine provides many of the same benefits as Arginine but to a greater degree and is gaining constant popularity in the fitness industry. 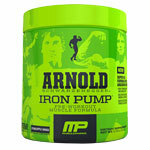 Its key advantage is enhancing muscle pumps, which it achieves through better nutrient partitioning. More muscle glycogen (the carbohydrates stored in muscle tissue) means more water retained in the muscle and thus a fuller look. It is also reported to increase nitric oxide synthase increasing blood flow to the muscles. Not only this but Agmatine has a number of other benefits. Agmatine is an essential supplement to the serious body builder or athlete. More than 3000mg daily has been reported to cause nausea and diarrhoea. 30gm container holds 40 serves. Statements on Label have not been evaluated by the Food & Drug Commission. Not suitable for children under the age of 18. Buy Primaforce Agmatine from Fitness Market and save! With our efficient dispatching and quick delivery throughout Australia, Primaforce Agmatine can be yours sooner. Below you can rate and add reviews for Primaforce Agmatine.